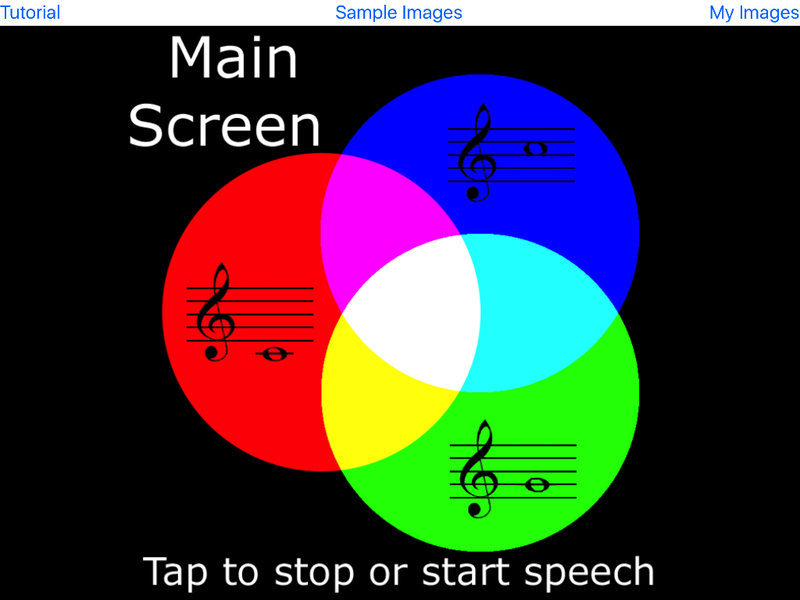 bviTouch is an app that lets blind and visually impaired users explore images on screen by providing musical tones to represent the colors under their finger as they move them about the image. The best results will be obtained by the use of headphones. Single finger swipe up on this screen to adjust speaking rate if not using Voice Over. Images are presented in the lower 90% of each screen. You can stop this instruction by a quick tap anywhere on the image portion of the screen. You can restart this instruction with another quick tap. This app works the same with or without Voice Over turned on. The best experience with the app is with the mobile device used in landscape orientation, with the long side horizontal and the short side vertical. It will work either way, but the images presented are much larger in landscape mode. There are three sections to the app. To go to the Tutorial section, do a quick single finger swipe down on the left side of the screen. To go to the Sample Images section, do a quick single finger swipe down in the middle of the screen. To select and explore an image that has already be stored on the mobile device by the user, do a quick single finger swipe down on the right side of the screen.